Whenever the calendar resets, I start to drift back to those films that garner annual viewings in my household. I’m usually the one that leads this parade, but now my teen children have started on such campaigns. “Hey, dad, we haven’t seen such-and-such in awhile.”, can be heard. Their mother just ignores these requests, whether from the kids or moi. Typically, giving me the look that silently communicates, and only reaffirms, whose DNA this offspring share. That said, I’ve done my usual springtime revisit to one of my favorite L.A. movies. L.A. Confidential. Many stirring aspects in this splendid 1997 film adaptation of James Ellroy’s novel make it better every time I do. This year, the film’s too often overlooked opening titles sequence gathered me completely. The archival film footage used, the touristy and glamour kind, visualized its superb prefatory monologue. Not as flamboyant as some, but the sequence marvelously set the tone from the start. 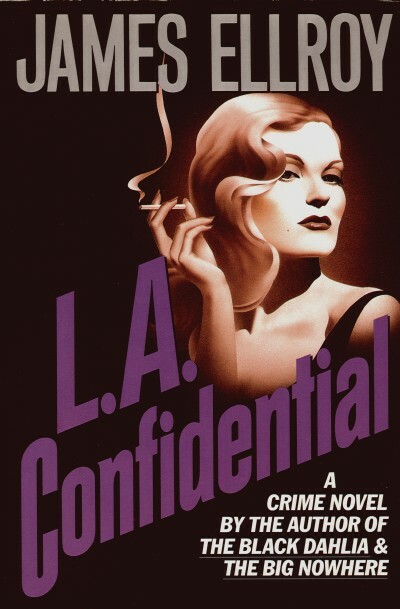 The movie title enters shortly after the Regency animated logo glides past, as the music rises, and mirrors the original cover’s font and angled text of Ellroy’s book. Though this time in contrasting blood-red, hinting at the violence and passion of the tale. The montage mimics the public perception sold to post-WWII America of the City of Los Angeles. Along with its modest cast titles interspersed in the excerpt, images of vintage Hollywood royalty and ripe starlets reign throughout. The voice of Sid Hudgens (Danny De Vito’s brassy voiceover), in the vernacular of his tabloid column, upending the deception. Dropping in some real local history along the way. The underlying dope, rackets, and prostitution, along with police corruption, given light. A sensational inception to the movie, keyed to a surprising pop song from the war-era in the background. Filmmakers refrained from using L.A. Confidential‘s stellar Jerry Goldsmith scored theme to lead off, as the composer’s comparably horn haunted Chinatown love theme did with that 1974 film. The motion picture this is most often compared with. 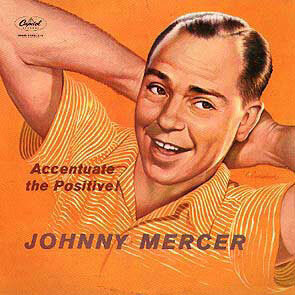 Here, the needle-dropped music and lyrics by Harold Arlen and Johnny Mercer, for the quirkily titled Ac-Cent-Tchu-Ate the Positive, fit perfectly. It should be noted, the film forgoes the original song‘s preamble, the set up to the musical sermon Mercer recalled in his lyrics — “…the topic will be sin…” — only chiming in as the band’s horns gave rise. A song used in film, and American and British television, throughout the decades since 1944. 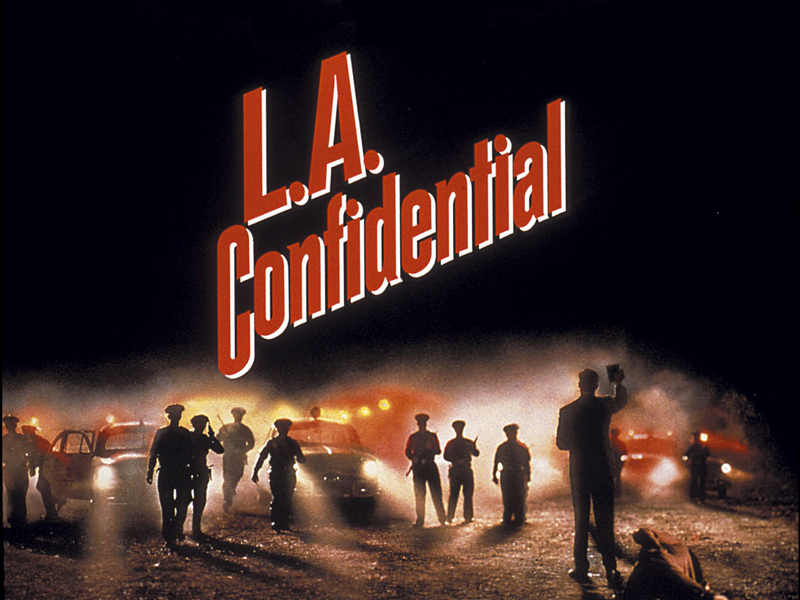 L.A. Confidential‘s opening titles sequence would deploy the original Mercer recording in keeping with the period depicted. Based on his recollection of a priest’s sermon, the subject of which ‘you got to accentuate the positive and eliminate the negative‘. Its lyrics analogous to what’s presented. Mocking to music the con and promise of stardom awaiting those who come to Los Angeles. The sequence gloriously crescendos to an ominous black backdrop, Curtis Hanson’s director’s credit lingering, as the song concludes. Leaving the audience jazzed for what’s to come. Come to Los Angeles! The sun shines bright, the beaches are wide and inviting, and the orange groves stretch as far as the eye can see. There are jobs aplenty, and land is cheap. Every working man can have his own house, and inside every house, a happy all-American family. You can have all this! And who knows? You could even be discovered … become a movie star! Or at least see one. Life is good in Los Angeles … it’s paradise on Earth. That’s what they tell ya, anyway. Because they’re selling an image. They’re selling it through movies, radio, and television. In the hit show “Badge of Honor,” the L.A. cops walk on water as they keep the city clean of crooks. Yep, you’d think this place was the Garden of Eden! But there’s trouble in paradise … and his name is Meyer Harris Cohen … Mickey C to his fans. Local L.A. color to the nth degree. And his #1 bodyguard, Johnny Stompanato. Mickey C’s the head of organized crime in these parts. He runs dope, rackets, and prostitution. He kills a dozen people a year! And the dapper little gent does it in style. And every time his picture’s plastered on the front page, it’s a black eye for the image of Los Angeles … because how can organized crime exist in the city with the best police force in the world? Something has to be done, but nothing too original, because hey! This is Hollywood! What worked for Al Capone would work for the Mickster. “Mr. Cohen, you are under arrest. Non-payment of federal income tax.” But all is not well. Sending Mickey up has created a vacuum, and it’s only a matter of time before someone with balls of brass tries to fill it. Remember dear readers, you heard it here first. Off the record … on the QT … and very … Hush-Hush. Reprise » Favorite Movies of L.A. I agree Mike – it’s a very memorable opening and I remain a big fan of the film even given the massive changes to the book and remaining unconvinced by the decisions on who lives and who dies at the end. Oh, thank you very much, Sergio. I understand your concerns about the changes made between the book and film. Great choice and dissertation. Michael! Though the opening montage needs Danny DeVito’s dirty sounding voice over to work and set the stage for what’s underneath the temptation and glamor. Fantastic post, Mike!I watched this one a few years ago and LOVED it! It might be time to watch it again! Oh, yes. Time to watch this again! 🙂 I love each time I come back to L.A. Confidential. Thanks so much, Fernando. I LOVE LOVE this movie! The dialog is really astounding, and you’ve highlighted some of the things that’s so great about LA Confidential. Great stuff Michael! Very nicely done. Great bit of work. Wonderful write-up. I also love this title sequence. I quite clearly remember queuing up at the theatre to watch this one with my mom. We both ended up loving it from the opening to the ending credits. Oh, thank you very much for the kind words and for loving this sequence. You and your mom have great taste. 🙂 What can I say?